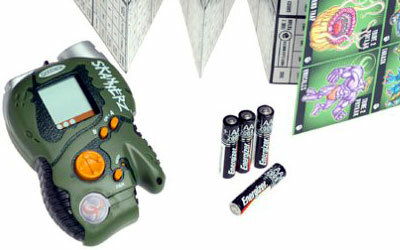 Scannerz UPC Game with Batteries. Unleash the world of monsters, magic and mayhem with Skannerz from Radica. Creatures from a distant planet are trapped in UPC bar codes. Begin scanning any consumer product for signs of life and start collecting. Unleash hundreds of monsters, weapons and magic. Use these to battle alone or connect with a friends Skannerz for head to head competition. Colors may vary. Four AAA batteries required, these are included in this special bundle pack.